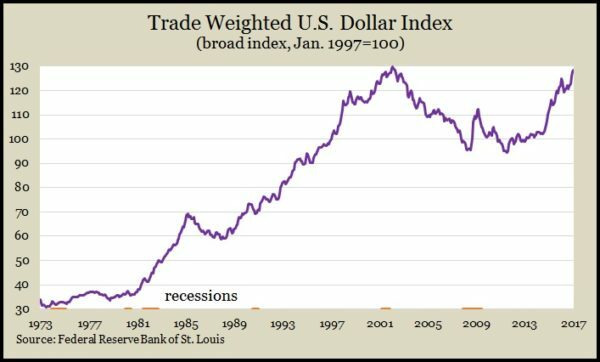 The strength or weakness of the U.S. dollar, weighed against other currencies, is driven by supply and demand factors. Since 2013, the dollar has strengthened against a broad basket of currencies, rising nearly 30%. The stronger dollar affects three main areas of concern to investors: consumers, industry and financial markets. Consumer spending accounts for about 70% of U.S. gross domestic product. When the dollar is strong, imports become cheaper. That means items and services brought in from other countries cost less to U.S. consumers. For example, at the start of 2014, $1 could be exchanged for about 0.74 euro, but at the end of 2016, $1 could be exchanged for about 0.95 euro – a markdown of almost 25% because of the strength of the dollar. A strong dollar thus can help U.S. consumers save money, which increases their disposable income, allowing them to spend more. The spending contributes to the sales and earnings of U.S. consumer goods companies and helps boost the U.S. economy. Landaas & Company provides this occasional glance at a current economic trend to help keep investors informed on some of the factors that can affect financial markets. Also, lower import prices help keep a lid on inflation, which gives the Federal Reserve more flexibility in raising interest rates. Of course, foreign companies could choose to leverage the strength of the dollar to increase profits, which would reduce the savings they pass along to their U.S. customers. A strong dollar has more of a mixed impact on U.S. industry. Just as a strong dollar makes importing to the U.S. cheaper, it also makes exported goods more expensive abroad, which reduces foreign demand for U.S.-made products. In addition, most global commodities (oil, metal, corn, coffee, etc.) are priced in U.S. dollars, so a stronger dollar makes those commodities more expensive. U.S.-based multinational companies that sell products globally – including manufacturing, pharmaceutical and technology companies – suffer from a strong dollar. 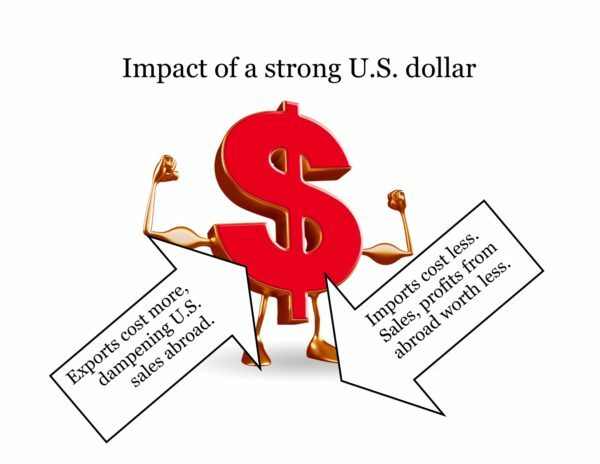 Companies that import their materials but primarily sell in the United States can take advantage of a stronger dollar through the lower import costs and then benefit from increased U.S. consumer spending. The financial markets revolve around earnings and interest rates – both of which are correlated to dollar movements. 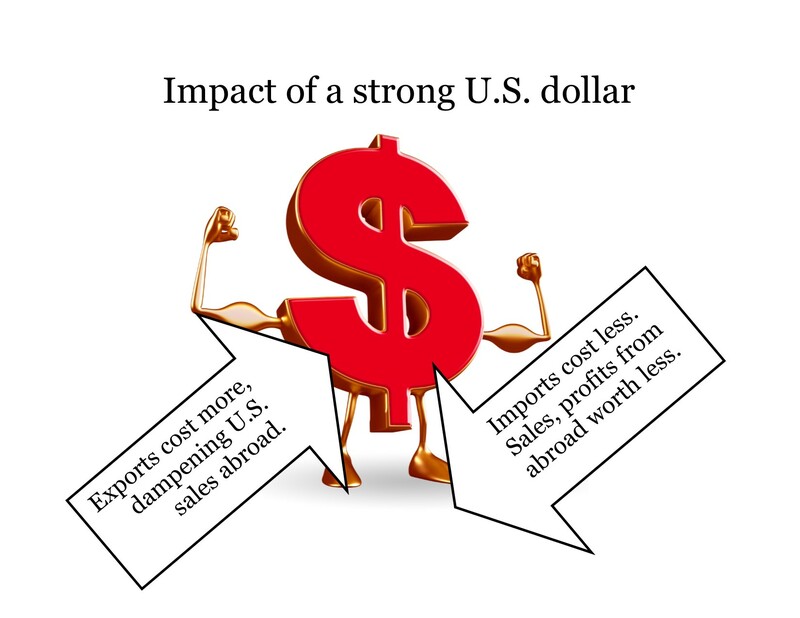 When the dollar is strong, foreign sales suffer from more expensive U.S. goods. When U.S.-based multinational companies convert the foreign currencies of revenue from abroad, they get fewer dollars than when the dollar is weaker. A strong dollar also tends to put downward pressure on interest rates. When the dollar is strong and interest rates are higher relative to the rest of the world, global demand for U.S. bonds increases. Not only can foreign investors get a higher yield from the U.S. bonds, but also – because of favorable exchange rates – they get more of their currency for each dollar of interest they receive. Demand for U.S. bonds helps drive up prices, but rates and prices move in opposite directions. So, the demand keeps rates low, thus hurting bond investors looking for income. The bottom line for investors is that a stronger dollar has a mixed impact. The increase in GDP from higher consumer spending typically outweighs the impact of weak exports on corporate earnings. The price appreciation of bonds will lead to higher market returns, but those looking for yield may be waiting longer.